We report one patient with proved primary mycobacterium tuberculosis of the nasopharynx and presenting similar cases by the reviewing literature. A 56-year-old woman presented with 5-6 years history of nasal obstruction, sleep with open mouth, and snoring. Right middle turbinate hypertrophic and pale appearance, nasal septum deviated to the right side and nasal based also has a crest were detected at an anterior rhinoscopy. Vegetative mass with smooth surface was protruding from the nasopharynx into the right nasal passage that was seen with endoscopic examination [Figure 1]. Ear and throat examination and blood investigations were normal. Sputum microscopy and culture were negative. No evidence of active tuberculosis in the chest and no systemic tuberculosis were observed. The patient's age was advanced, and mass was located one-sided of the nasopharynx for the differential diagnosis of the nasopharyngeal pathology, nasopharynx computerized tomography (CT) was planned. On computed tomography of nasopharynx, the massive space occupying lesions was detected. Nasopharynx tissue samples were obtained under local anesthesia, which showed feature of chronic caseous granulomatous infection, non-necrotizing granulomas under the ciliated respiratory epitelium on the surface of lymphocytic nasopharyngeal mucosa [Figure 2]a, giant granuloma containing coagulation necrosis and Langhans type giant cells in the center [Figure 2]b, and crypt that was lined with ciliated epithelium and granulomas [Figure 2]c. No malignant cells were observed. Therefore, the biopsy material's histopathologic examination showed features of tuberculosis, and diagnosis confirmed as tuberculosis by the pathologists. Patient was treated with medical therapy (isoniazid, rifampisin, pirazinamid, and etambutol) for 9 months. Significant clinical improvement was observed in the third month of the treatment, and the nasopharyngeal mass resolved after a 3 months anti-tuberculous therapy. Nasopharyngeal tuberculosis usually appears as a complication of pulmonary tuberculosis. Usually, as a result of upper respiratory tract contact with the lung secretions, infection spreads to the upper respiratory tract. Nasopharyngeal tuberculosis appears in 1.9% of patients with pulmonary tuberculosis. However, primary nasopharyngeal tuberculosis without the lung involvement is very rare. According to Rohwedder et al.,  only 0.1% nasopharyngeal involvement were detected in primary active pulmonary tuberculosis patients. However, the nasopharynx is a relatively silent region, and the disease may be more common than suspected, , especially in endemic areas and with an increase in HIV. The most frequent manifestation of head and neck tuberculosis (95%) is cervical lymphadenitis. Vayýsoðlu et al . reported a series of 40 patients with tuberculosis in the head and neck region. Forty-one patients had cervical lymphadenopathy, 2 patients had parotid gland tuberculosis, 2 patients had nasopharyngeal tuberculosis, and 3 patients were diagnosed as tongue, tonsil, and larynx tuberculosis, respectively. Choudhury et al. reported a series of 33 patients with tuberculosis in the head and neck region who were diagnosed in 4 years period. In 19 patients (58%), the presenting feature was cervical lymphadenitis, 9 had salivary gland, 2 laryngeal and 1 each nasopharyngeal, hypopharyngeal and ear tuberculosis. 21 patients required some sort of surgical procedure for diagnosis. Altuntaş et al . reported 4 patients' primary head and neck region tuberculosis; 1 patient had larynx tuberculosis, 1 patient had parotid gland tuberculosis, 1 patient had paranasal sinus tuberculosis, and 1 patient was diagnosed as nasal tuberculosis, respectively. In all of these studies, diagnosis was confirmed by excisional biopsy in all patients, and lesions were resolved after anti-tuberculosis chemotherapy. As in the literature, the diagnosis of tuberculosis in our patient was based on a histopathological examination, demonstrating a granulomatous reaction with typical caseous necrosis and treatment with anti-tuberculosis drugs have done. The standard treatment of tuberculosis requires the application of different drugs. Patients are 2-month treated with 4 drugs (isoniazid, rifampicin, pyrazinamide, and ethambutol), followed by 4-month treated with two drugs (isoniazid and rifampicin). The treatment for extra pulmonary tuberculosis is the same as for pulmonary tuberculosis. The prognosis of the nasopharynx tuberculosis is pretty good with anti-tuberculosis therapy if treatment duration is not less than 6 months. Clinical improvement in patients with this treatment as soon as possible and provide healing without sequelae. In our case, clinical improvement was started at the third month and treatment was terminated at the ninth month. As a result, nasopharyngeal tuberculosis is a rare disease; it usually occurs in the presence of active pulmonary and systemic infections. 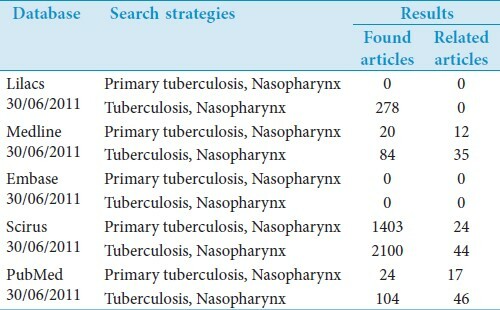 Usually, nasopharyngeal tuberculosis is limited to a single patient who is published in the literature. 1. WHO report 2008: Global tuberculosis control d surveillance, planning, financing. Core Health Indicators. Available from: http://www.who.int/tb/publications/global report/2008/pdf/fullreport.pdf. [Last accessed on 09 Mar 05]. 2. King AD, Ahuja AT, Tse GM, van Hasselt AC, Chan AB. MR Imaging Features of Nasopharyngeal Tuberculosis: Report of Three Cases and Literature Review. AJNR Am J Neuroradiol 2003;24:279-82. 3. Waldron J, van Hasselt CA, Skinner DW, Arnold M. Tuberculosis of the nasopharynx: Clinicopathological features. Clin Otolaryngol Allied Sci 1992;17(1):57-9. 4. Özkırıº M, Kubilay U, Aydin E, Özkiriº F, Kayabaºoðlu G, Ünver ª. Primary nasopharyngeal tuberculosis. KBB-Forum 2005;4[online]. 5. Rieder HL. Epidemiology of tuberculosis in Europe. Eur Respir J Suppl 1995;20:620-32. 6. Nalini B, Vinayak S. Tuberculosis in ear, nose, and throat practice: Its presentation and diagnosis. Am J Otolaryngol 2006;27:39-45. 7. Rohwedder JJ. Upper respiratory tract tuberculosis: Sixteen cases in a general hospital. Ann Intern Med 1974;80:708-13. 8. Sharma HS, Kurl DN, Kamal MZ. Tuberculoid granulomatous lesion of the pharynx: Review of the literature. Auris Nasus Larynx 1998;25:187-91. 9. Yılmaz YF, Tezer MS, Titiz A, Özlügedik S, Yalçin F, Ünal A. Snoring and obstructive sleep apnea due to Nasopharyngeal tuberculosis. Gazi Medical Journal 2005:16:47-9. 10. Percodoni J, Brown F, Yardeni E, Murris-Espin M, Serrano E, Arrue P, et al. Nasopharyngeal tuberculosis. J Laryngol Otol 1999;113:928-31. 11. Civelek ª, Sayın Ý, Ercan Ý, Çakýr BÖ, Turgut S, Baþak T. Nasopharyngeal tuberculosis: A case report. Turk Arch Otolaryngol 2008;46:53-7. 12. Tse GM, Ma TK, Chan AB, Ho FN, King AD, Fung KS, et al. Tuberculosis of the nasopharynx: A rare entity revisited. Laryngoscope 2003;113:737-40. 13. Arnold M, Chan CY, Cheung SW, van Hasselt CA, Frencht GL. Diagnosis of nasopharyngeal tuberculosis by detection of tuberculostearic acid in formalin fixed, paraffin wax embedded tissue biopsy specimens. J Clin Pathol 1988;41:1334-6. 14. Kim KS. Primary Nasopharyngeal Tuberculosis Mimicking Carcinoma A Potentially False-Positive PET/CT Finding. Clin Nucl Med 2010;35:346-8. 15. Cleary KR, Batsakis JG. Mycobacterial disease of the head and neck: Current perspective. Ann Otol Rhinol Laryngol 1995;104:830-3. 16. Vayısoðlu Y, Unal M, Ozcan C, Görür K, Horasan ES, Sevük L. Lesions of tuberculosis in the head and neck region: A retrospective analysis of 48 cases. Kulak Burun Bogaz Ihtis Derg 2010;20:57-63. 17. Choudhury N, Bruch G, Kothari P, Rao G, Simo R. 4 years' experience of head and neck tuberculosis in a south London hospital. J R Soc Med 2005;98:267-9. 18. Altuntaº EE, Doðan M, Müderris S, Elagöz ª. Extranodal tuberculosis of head and neck: A report of four cases. Cumhuriyet Med J 2009;31:60-5. 19. Helbling CA, Lieger O, Smolka W, Iizuka T, Kuttenberger J. Primary tuberculosis of the TMJ: Presentation of a case and literature review. Int J Oral Maxillofac Surg 2010; 39:834-8.